Oh, the places you may, or may not, go! 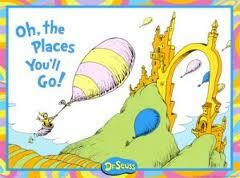 Dr. Seuss said I was going places. In fact, he guaranteed it. So far though I haven’t and that’s very difficult for me to come to terms with. I just don’t think it’s right for doctors to lie to children. How can I ever trust the medical community again? I really believed it, too, when he told me that I had brains in my head and feet in my shoes, and that I could steer myself any direction I’d choose. But that’s not the way things really played out. I was too scared to steer myself the way I wanted to go and was too easily influenced by other people’s expectations. Now, after taking so much direction from others, I don’t even know where I am anymore. I don’t really remember from which road I came and feel paralyzed by indecision in deciding which way to go. Despite all my hard work and all my ambitions, so far things have been pretty ordinary. I haven’t really gone anywhere significant and I haven’t really accomplished anything of consequence. I still haven’t tackled any of the big stuff that I always dreamed about. You know, like living in Paris and driving an orange Vespa. Maybe I’m just not as brainy and footsy as Dr. S. thought? Maybe he got the diagnosis wrong when it came to me? or a sign that says they should believe in God. or waiting for themselves to ovulate. waiting for their lives to start. I have to believe I’ll eventually find my way. I would absolutely love to hear from you. Have you not subscribed to SadintheCity yet? What are you waiting for? Just enter your email address on the right hand side to get post updates. a great post! i wish my spiralling negative thoughts came out in rhyme. Since they don’t though, and also torture me…i have no choice but to try to silence them with answers. Part of believing in yourself is believing in your old self. So we should recognize the choices we’ve already made. We tend to think of the decisions we do make as non-decisions (following the crowd, just the thing to do, or inconsequential) and the decisions we don’t make as real, live, actual decisions. Its a trick of the mind. They’re all equal, and they all represent things we wanted and tried hard to get. Its just that once we have them they seem obvious. …oh yeah, and Paris doesn’t seem so great…only place i’ve ever gotten mugged. What a beautiful, insightful and healthy perspective Maya. You are so right. I am very dismissive of my decisions and the hard work that went into them and came out of them. Thank you for opening my eyes to this. So well said. But you’re posting regular blogs on your own website. That’s not passively waiting in my book (not that I’ve written a book, mind you). Personally, I’m more of the one-foot-in-front-of-the-other than the pursue-your-passionate-dreams School of Life. I think it gets you further. I think that’s a wonderful philosophy Dan. Thank you so much for sharing. 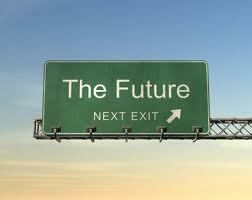 I only hope that I am walkin’ in the right direction! This is so good that I am finally ready to publicly give you the credit for writing my Seuss-inspired Grinch movie review for the UWO Gazette in 2000. I’ve been carrying that dirty little secret around for over a decade. Your blog has really inspired me to be honest with myself. This made me laugh so hard. I’ve never written LOL before but I understand now why it was invented. Your memory, though, is failing you-it’s not true. I merely suggested an article in rhyme, while you scribed it. That makes you Mark Zuckerberg and me the Winkelvosses. So, will you introduce me to Justin Timberlake? Wendy – your writing is just amazing! I love this blog and I can’t wait to read your book – keep at it! Thank you so much Corrie. I really hope there will eventually be one for you to read! You must paddle through it as fast as you can – hope you publish your book – I’m already a fan. Thank you, dear Yulia, for taking the time to write! Seriously, BEST COMMENT EVER! Thank you!